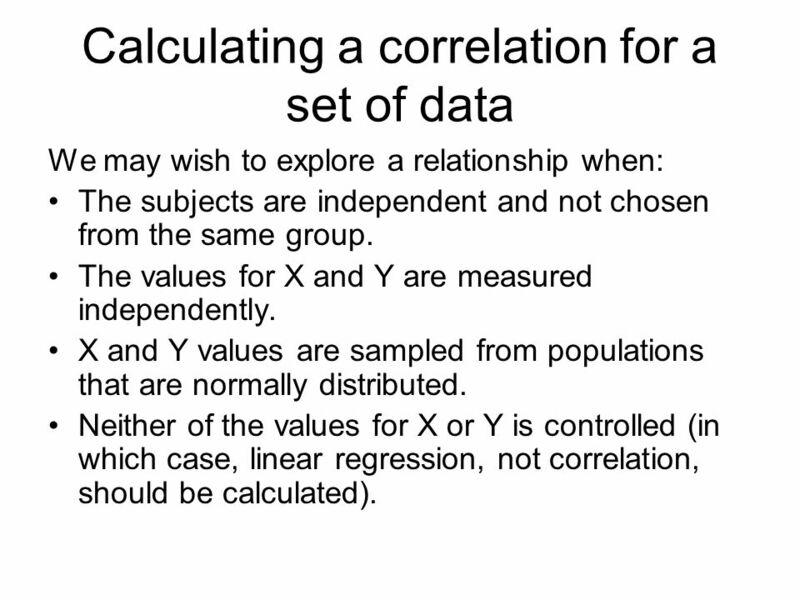 Choose and apply the most appropriate statistical techniques for exploring relationships and trends in data (correlation and inferential statistics). Hypothesis formulation. 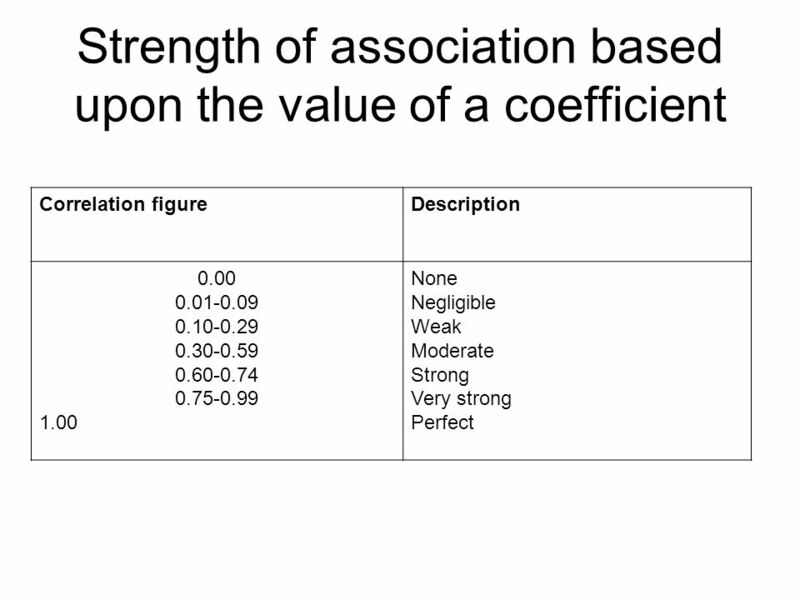 Specification of significance level (to see how safe it is to accept or reject the hypothesis). 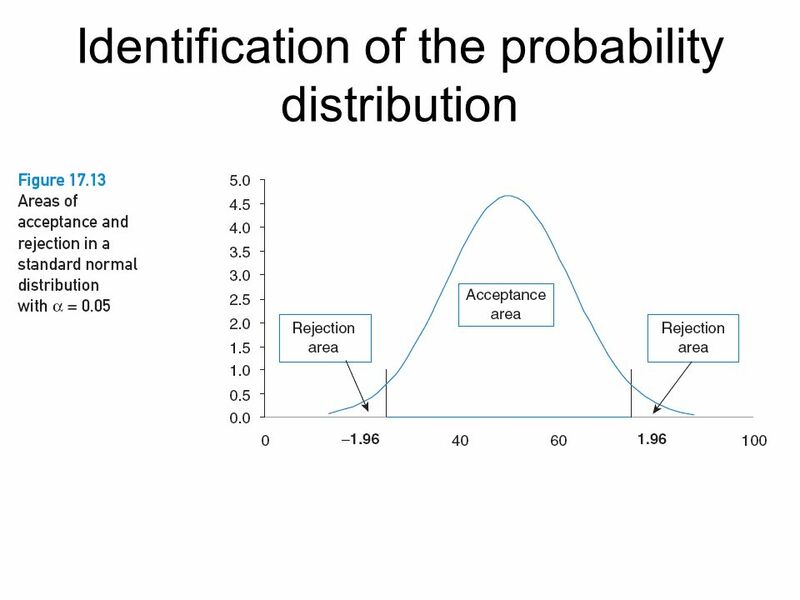 Identification of the probability distribution and definition of the region of rejection. 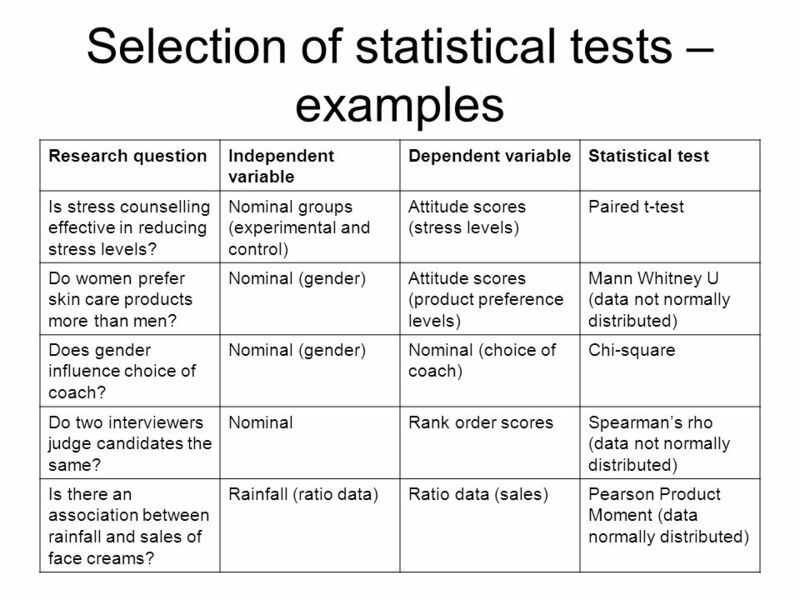 Selection of appropriate statistical tests. 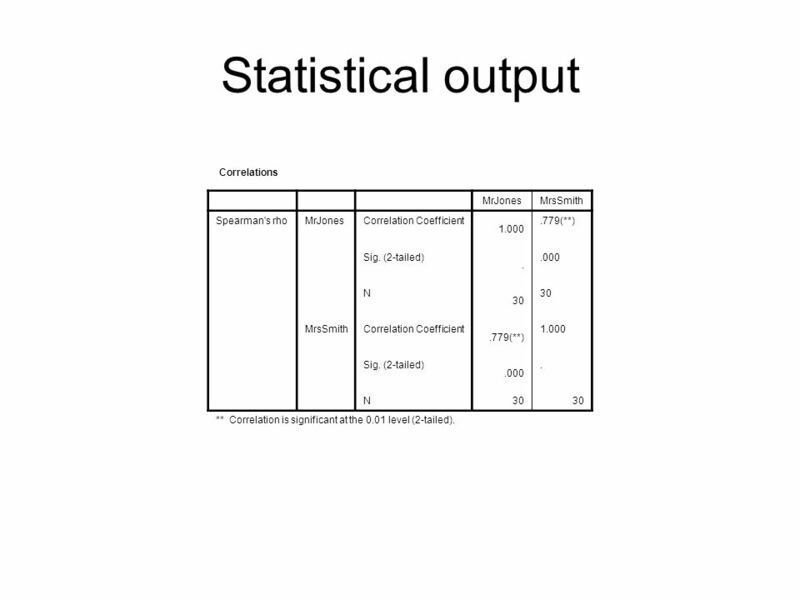 Calculation of the test statistic and acceptance or rejection of the hypothesis. 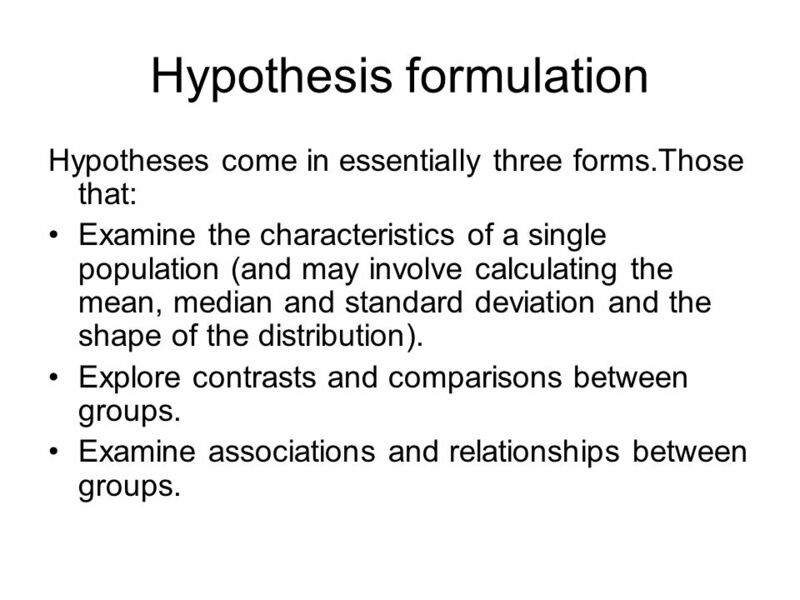 Hypotheses come in essentially three forms.Those that: Examine the characteristics of a single population (and may involve calculating the mean, median and standard deviation and the shape of the distribution). Explore contrasts and comparisons between groups. 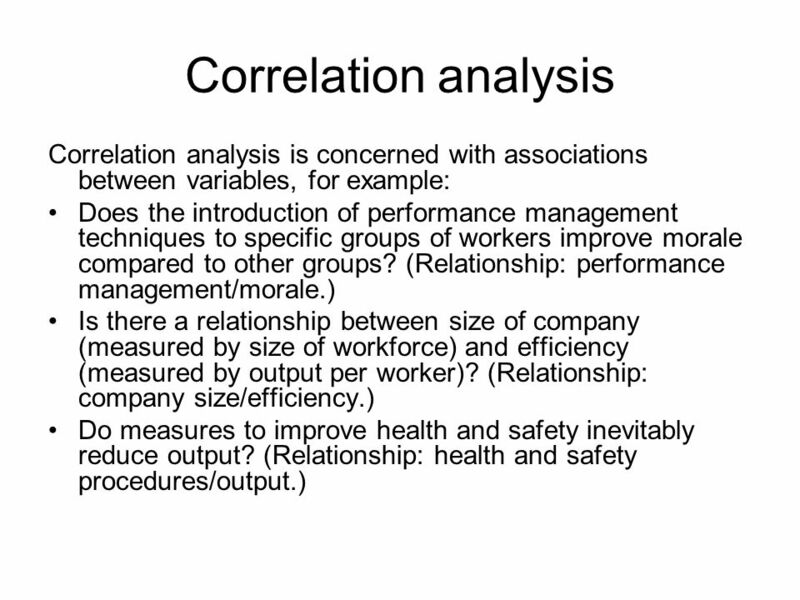 Examine associations and relationships between groups. 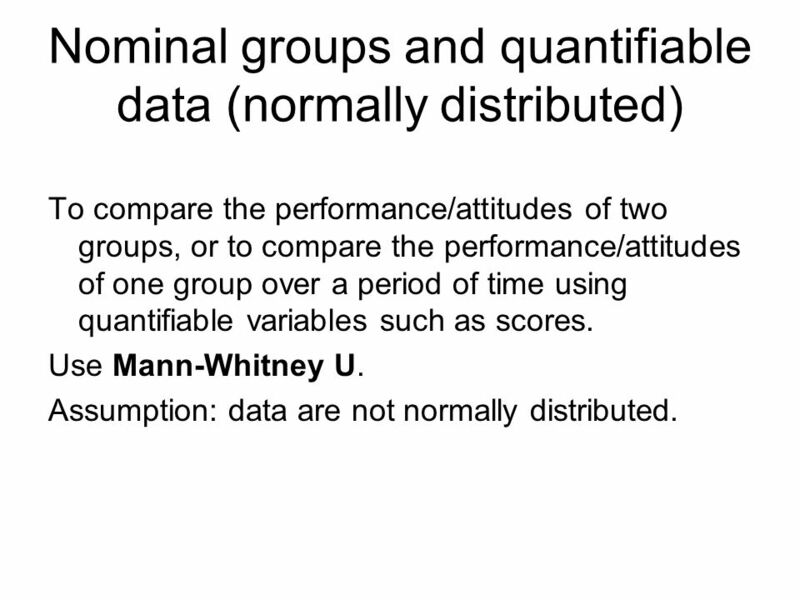 To compare the performance/attitudes of two groups, or to compare the performance/attitudes of one group over a period of time using quantifiable variables such as scores. 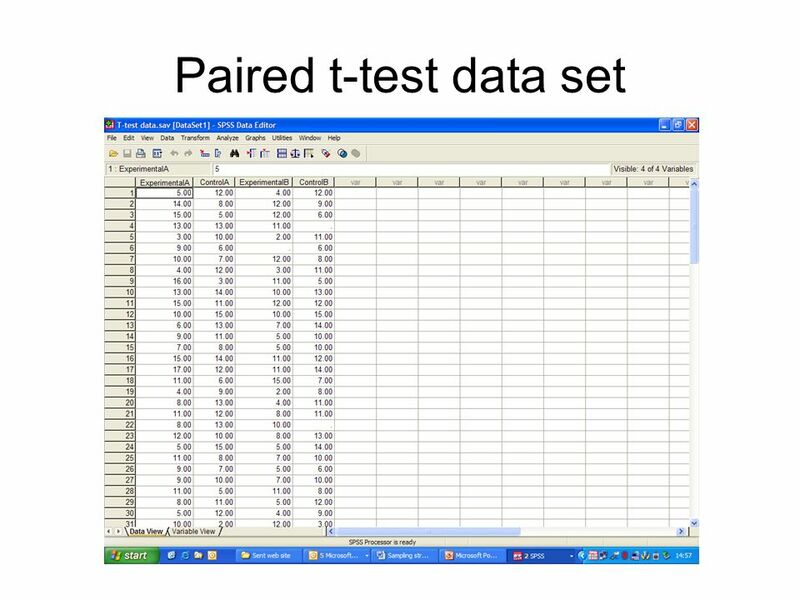 Use paired t-test which compares the means of the two groups to see if any differences between them are significant. 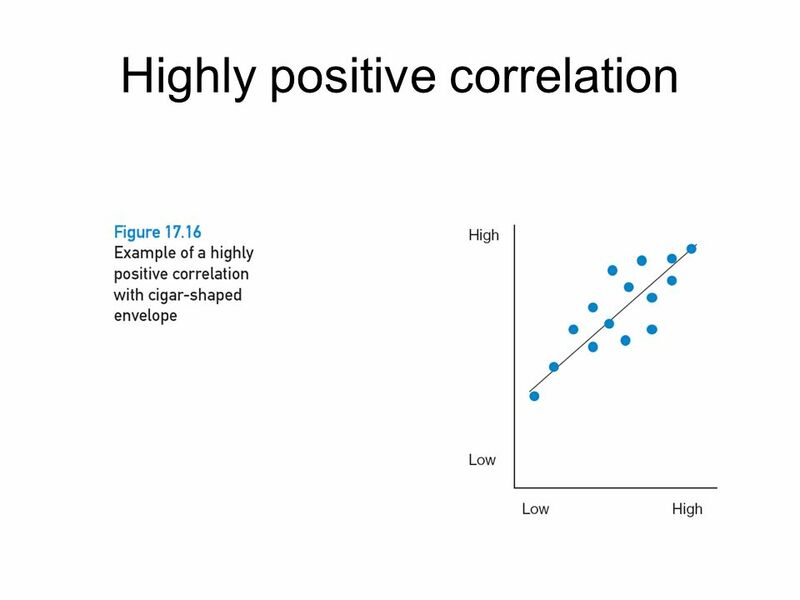 Assumption: data are normally distributed. 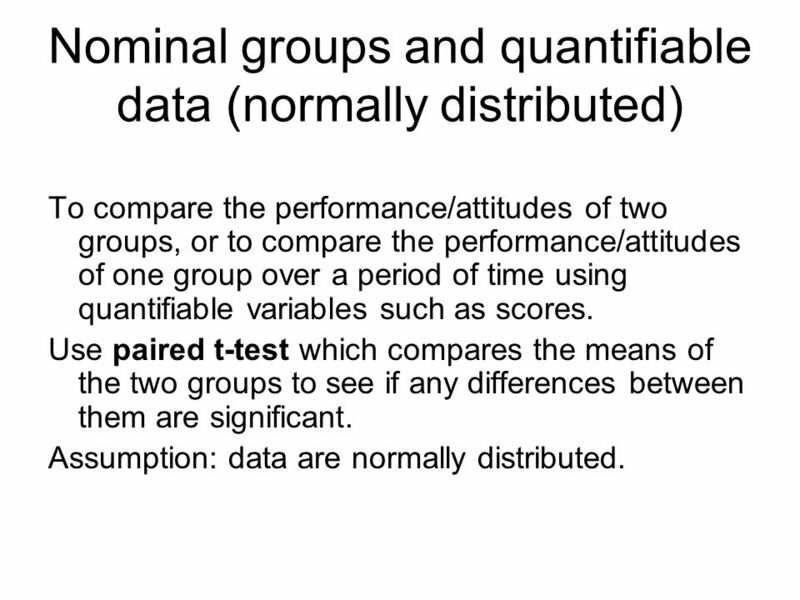 To compare the performance/attitudes of two groups, or to compare the performance/attitudes of one group over a period of time using quantifiable variables such as scores. 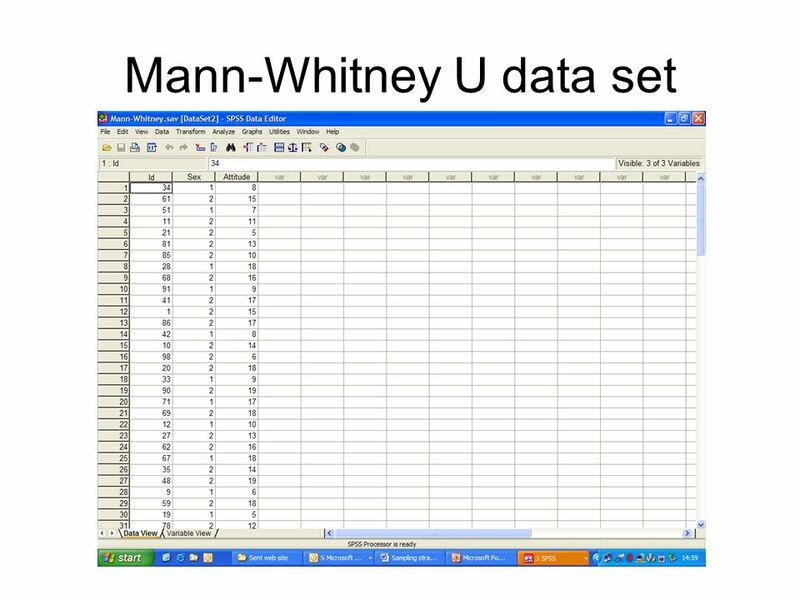 Use Mann-Whitney U. Assumption: data are not normally distributed. 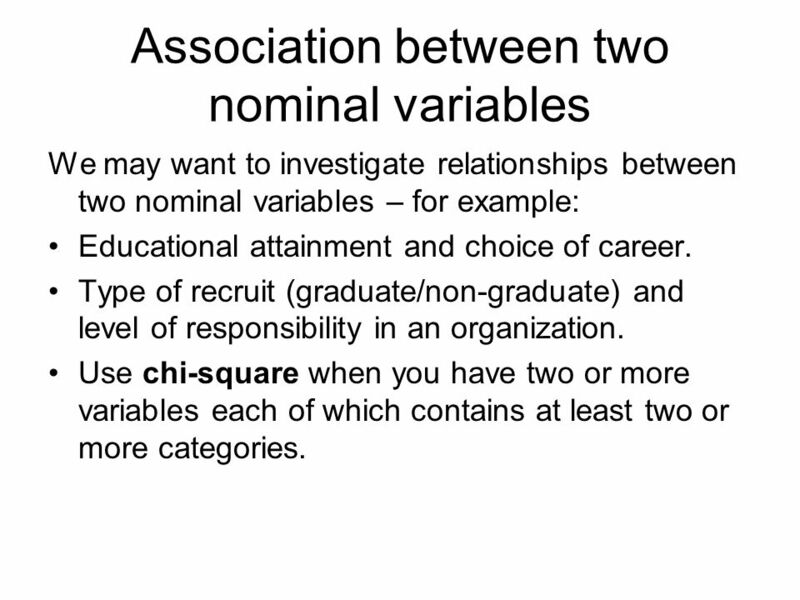 We may want to investigate relationships between two nominal variables – for example: Educational attainment and choice of career. Type of recruit (graduate/non-graduate) and level of responsibility in an organization. 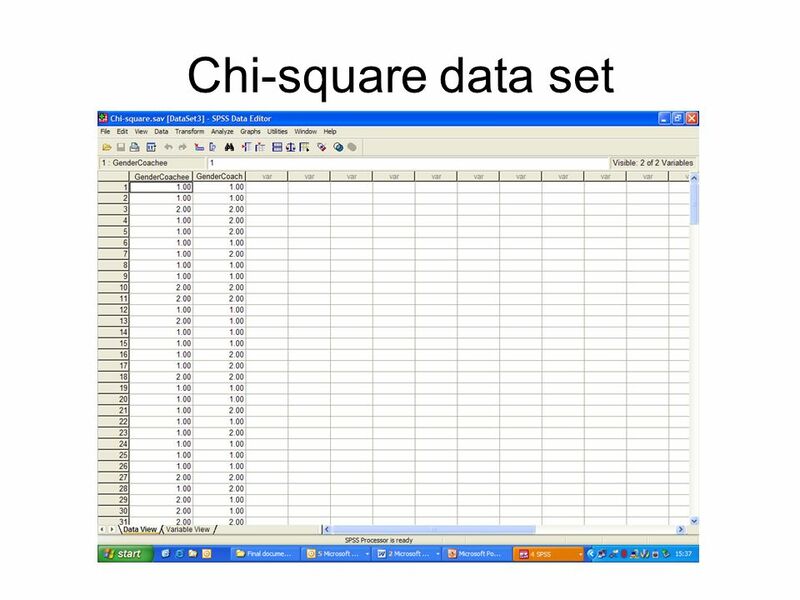 Use chi-square when you have two or more variables each of which contains at least two or more categories. Exact Sig. (2-sided) Exact Sig. (1-sided) Pearson Chi-Square .382(b) 1 .536 Continuity Correction(a) .221 .638 Likelihood Ratio .383 Fisher's Exact Test .556 .320 Linear-by-Linear Association .380 .537 N of Valid Cases 201 a Computed only for a 2x2 table b 0 cells (.0%) have expected count less than 5. The minimum expected count is Symmetric Measures Value Approx. Sig. Nominal by Nominal Phi .044 .536 Cramer's V N of Valid Cases 201 a Not assuming the null hypothesis. b Using the asymptotic standard error assuming the null hypothesis. We may wish to explore a relationship when: The subjects are independent and not chosen from the same group. The values for X and Y are measured independently. 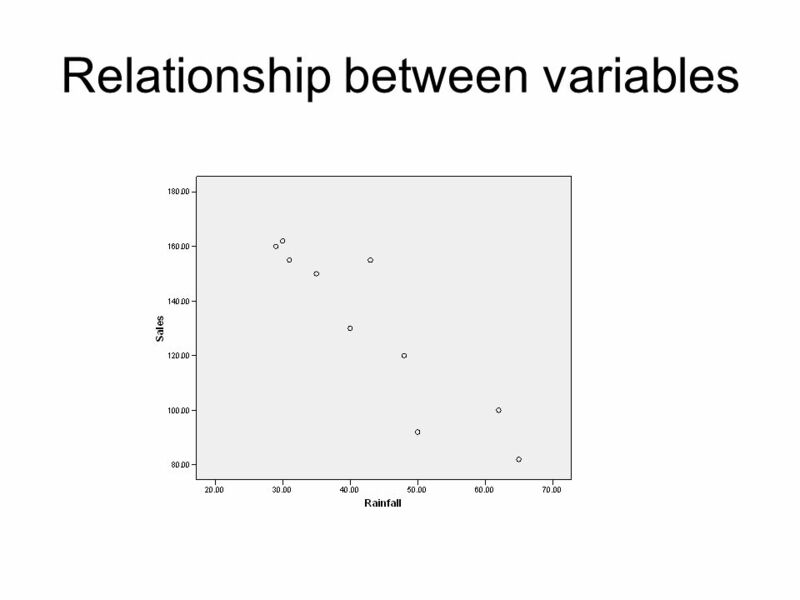 X and Y values are sampled from populations that are normally distributed. 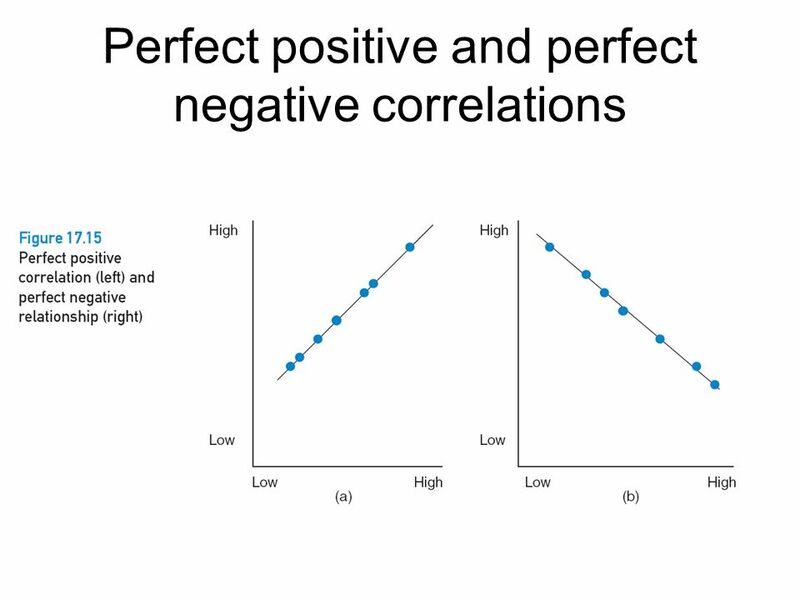 Neither of the values for X or Y is controlled (in which case, linear regression, not correlation, should be calculated). 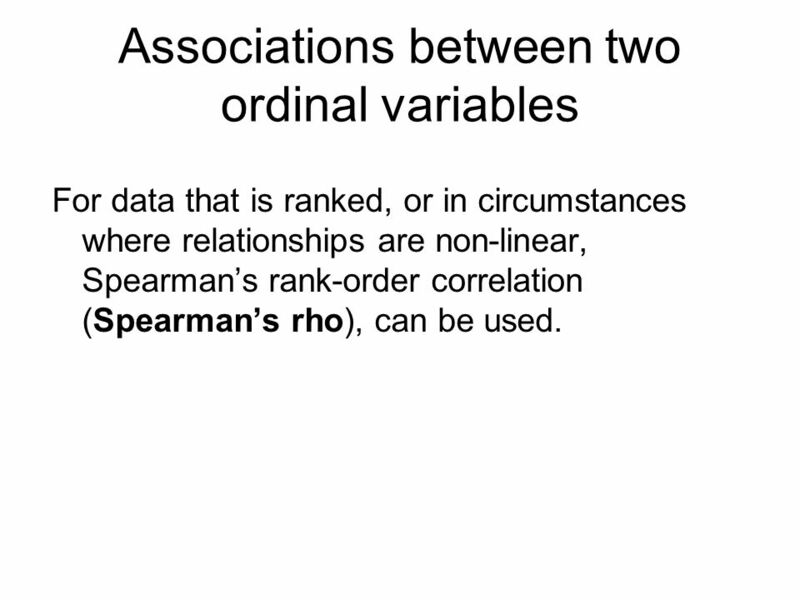 For data that is ranked, or in circumstances where relationships are non-linear, Spearman’s rank-order correlation (Spearman’s rho), can be used. Correlation Coefficient 1.000 .779(**) Sig. (2-tailed) . .000 N 30 ** Correlation is significant at the 0.01 level (2-tailed). 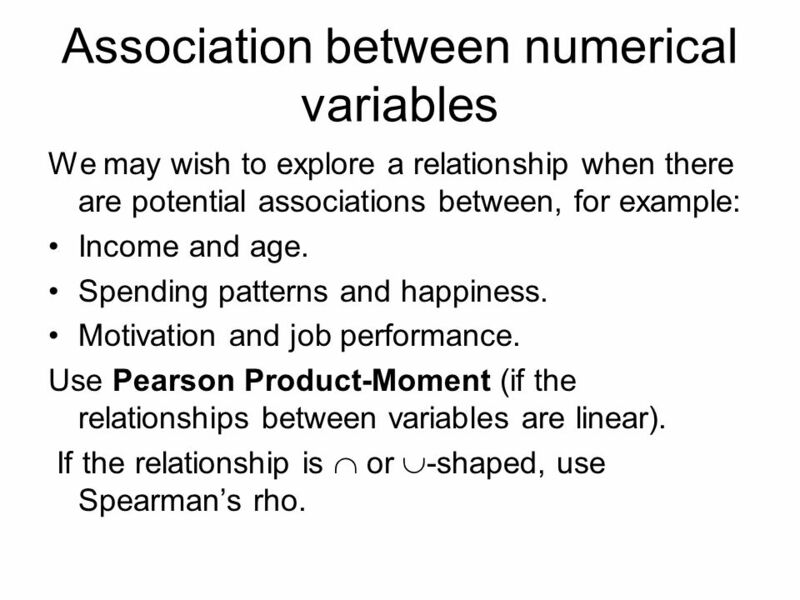 We may wish to explore a relationship when there are potential associations between, for example: Income and age. Spending patterns and happiness. Motivation and job performance. 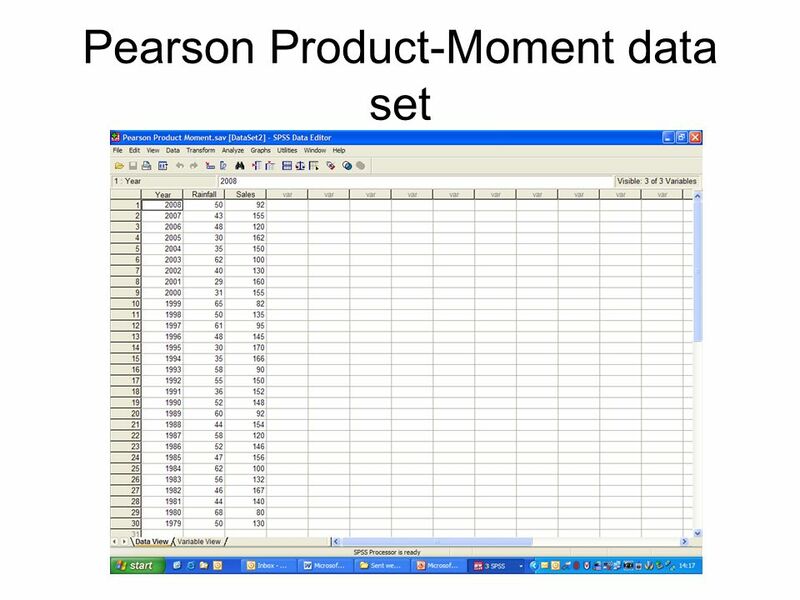 Use Pearson Product-Moment (if the relationships between variables are linear). 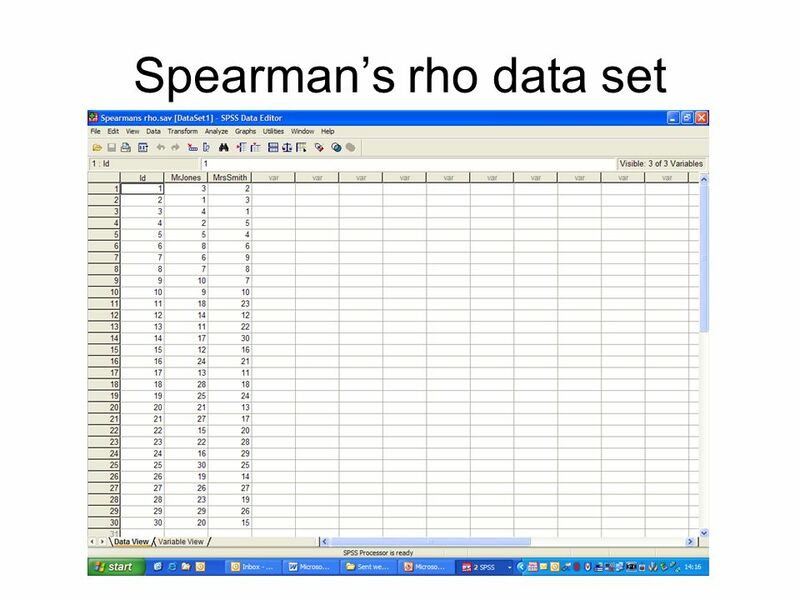 If the relationship is  or -shaped, use Spearman’s rho. Rainfall 48.17 11.228 30 Sales 132.47 28.311 Correlations Rainfall Sales Pearson Correlation 1 -.813(**) Sig. (2-tailed) .000 N 30 ** Correlation is significant at the 0.01 level (2-tailed). 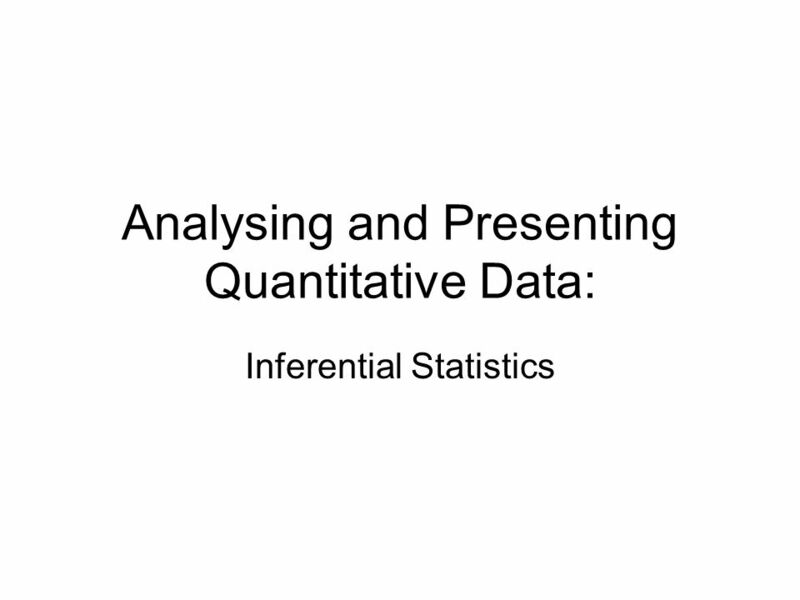 32 Summary Inferential statistics are used to draw conclusions from the data and involve the specification of a hypothesis and the selection of appropriate statistical tests. 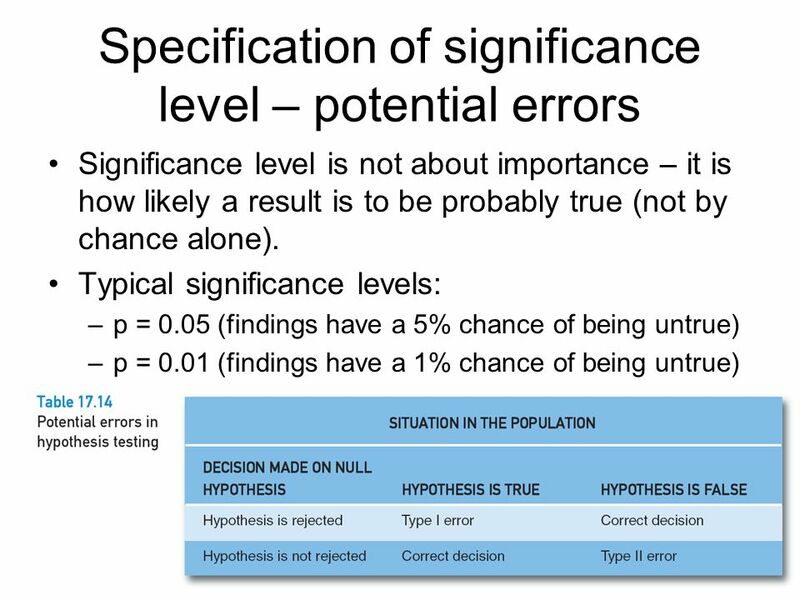 Some of the inherent danger in hypothesis testing is in making Type I errors (rejecting a hypothesis when it is, in fact, true) and Type II errors (accepting a hypothesis when it is false). 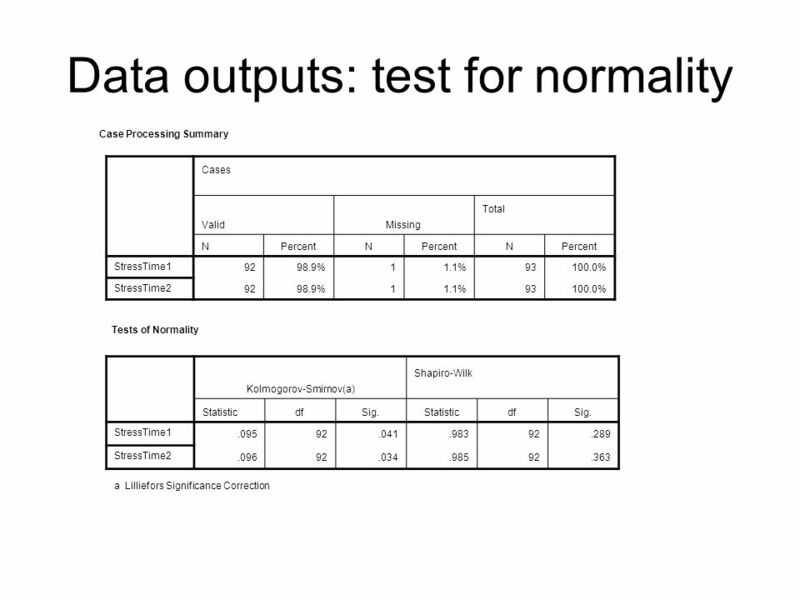 For categorical data, non-parametric statistical tests can be used, but for quantifiable data, more powerful parametric tests need to be applied. 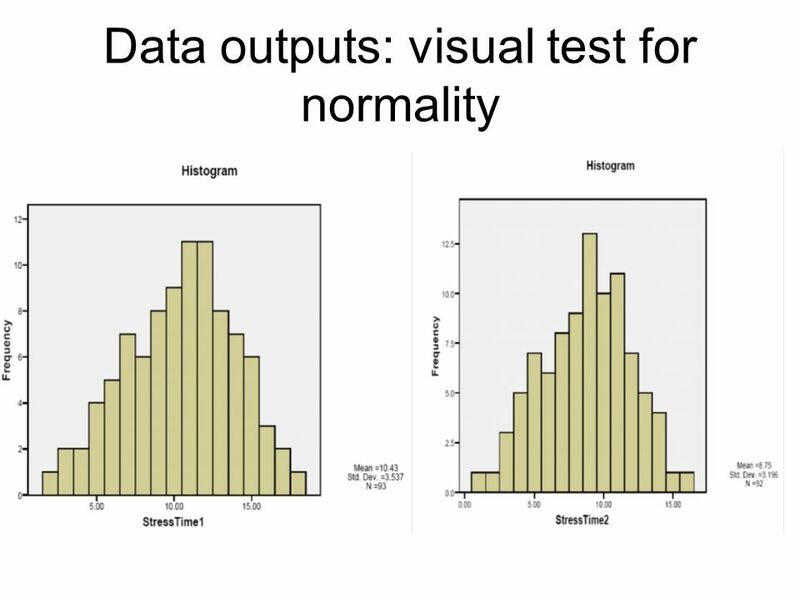 Parametric tests usually require that the data are normally distributed. 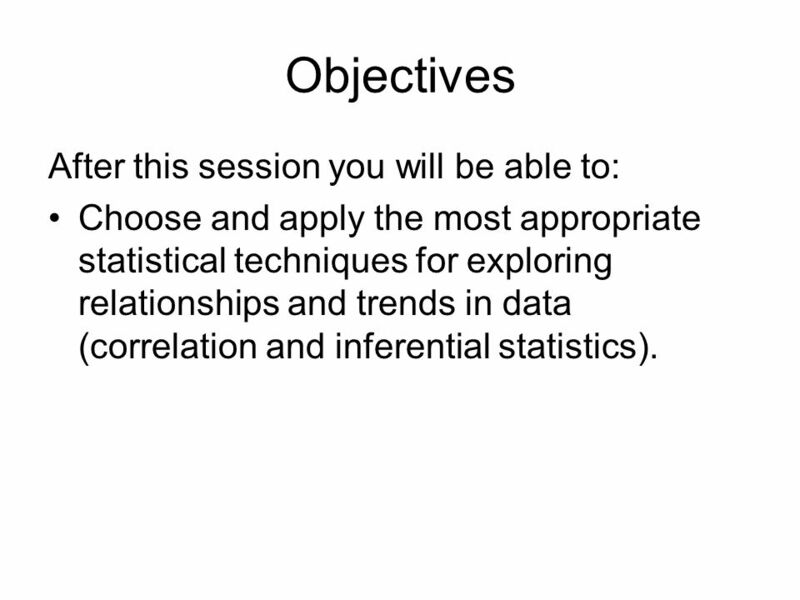 Download ppt "Analysing and Presenting Quantitative Data:"
Contingency Table Analysis Mary Whiteside, Ph.D..
Statistics. 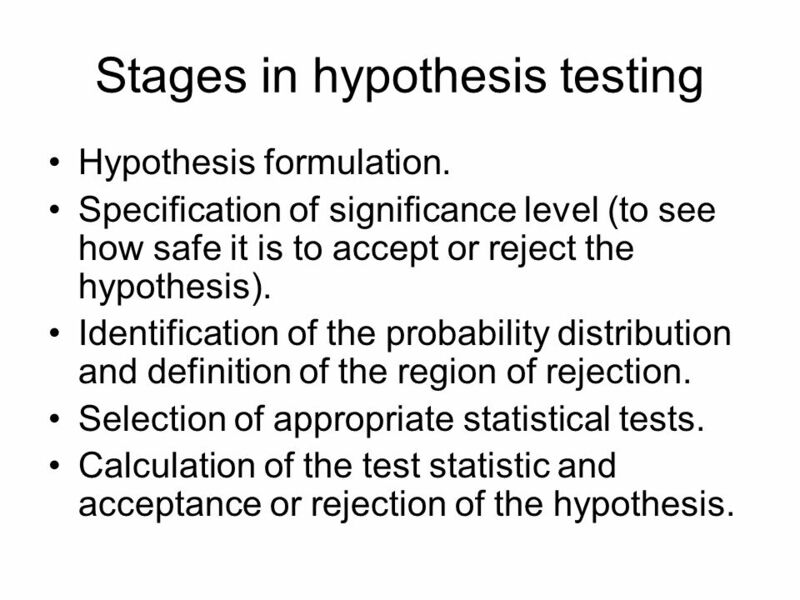 Hypothesis Testing Hypothesis is a ‘testable statement’ Types = alternate, research, experimental (H1), null (H0) They are 1 or 2 tailed (directional. STATISTICAL ANALYSIS. Your introduction to statistics should not be like drinking water from a fire hose!! Hypothesis Testing Chapter 13. 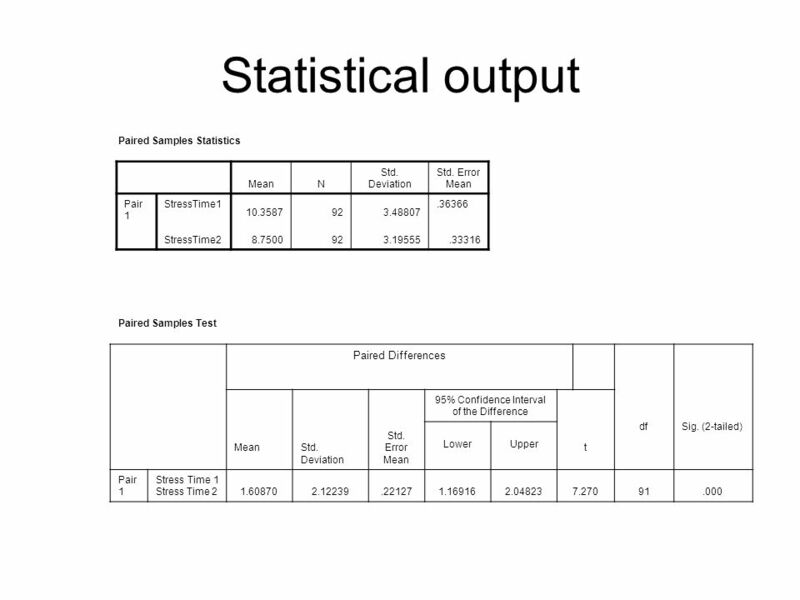 Hypothesis Testing Decision-making process Statistics used as a tool to assist with decision-making Scientific hypothesis. Chapter 11 Contingency Table Analysis. Nonparametric Systems Another method of examining the relationship between independent (X) and dependant (Y) variables. 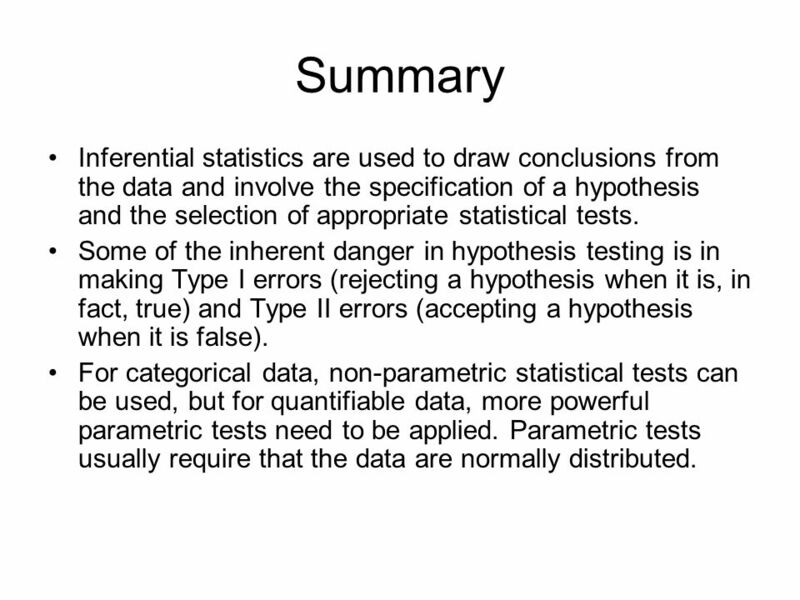 Statistical Tests Karen H. Hagglund, M.S. 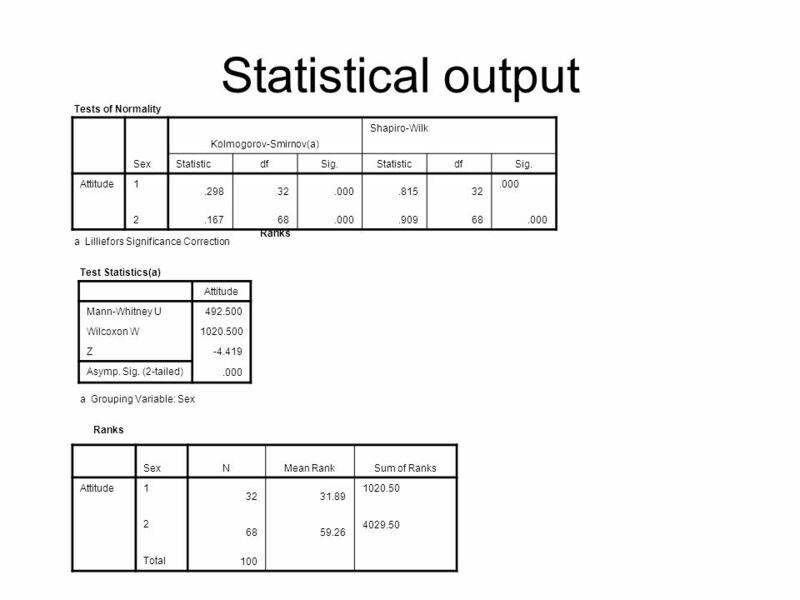 Statistics II: An Overview of Statistics. 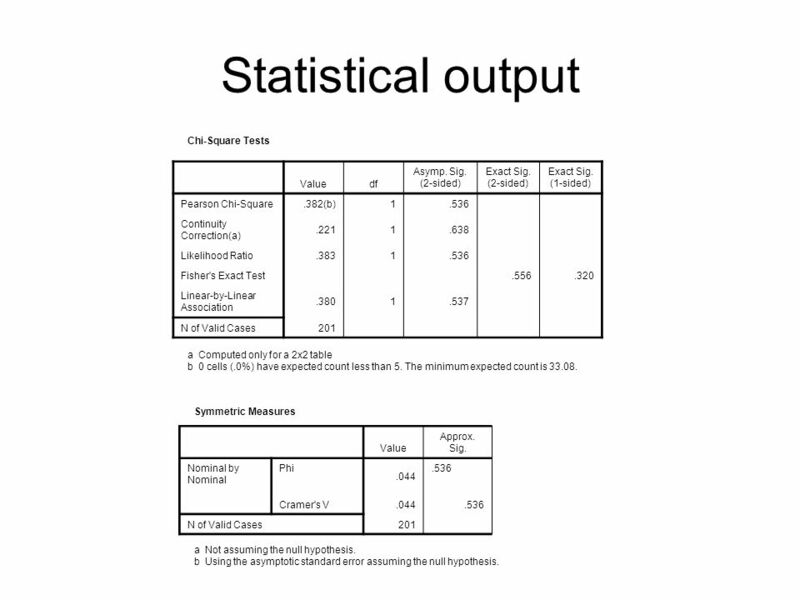 Outline for Statistics II Lecture: SPSS Syntax – Some examples. Normal Distribution Curve. Sampling Distribution. Data Analysis Statistics. Inferential statistics. Educational Research by John W. Creswell. Copyright © 2002 by Pearson Education. All rights reserved. 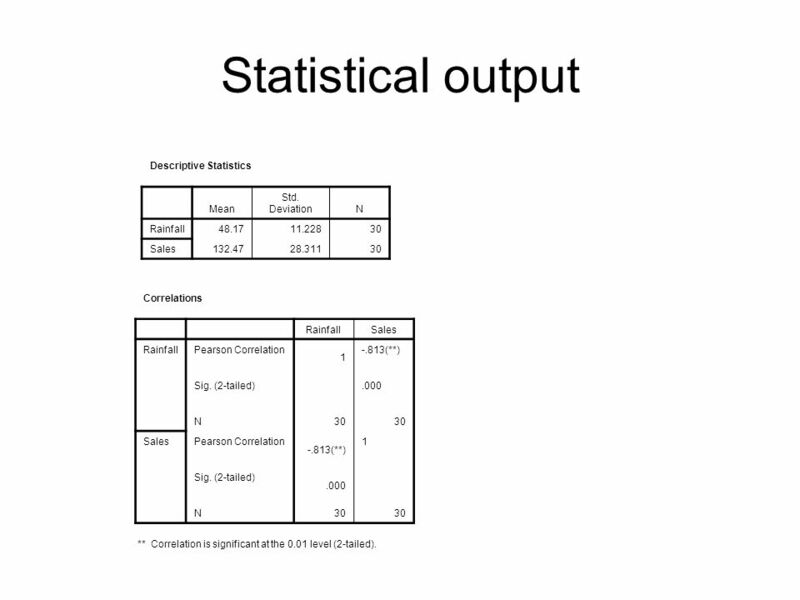 Slide 1 Chapter 8 Analyzing and Interpreting Quantitative.